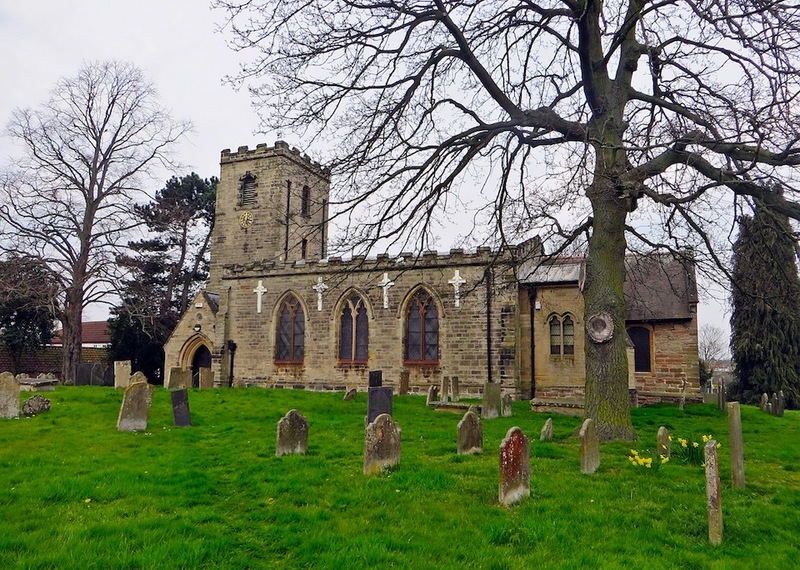 The Domesday Book of 1086 records that Calverton had a church and a priest. Nothing for certain remains of this Saxon Church, but it was probably on the same site for the solid sandstone is close to the surface, making an excellent foundation for a large building. The present church is built on the living rock, and the local sandstone is one of the chief building materials. A good place to start a tour of the church is the chancel steps, for the Norman piers supporting the chancel arch are the oldest standing parts of the present building. They have been dated as before 1160, but in the capital of the north pier is a carved panel which takes us back to a far more remote period of history, for it records the first establishment of Christianity in Calverton, when St Wilfrid of Ripon, patron saint of Calverton (as of many other villages in this area) accepted the invitation of Wulfhere, Christian King of Mercia, to assist in the evangelisation of his kingdom in about the year 666 A.D. St. Wilfrid, who was Bishop of York, is shown giving the blessing after the baptism of a convert, who is depicted naked, ‘new born’ from the waters of baptism. The NORMAN CHURCH was probably not much, if at all, wider than the present tower but when the round Roman Chancel arch was replaced in the 13th century by the present Early English pointed arch, the nave and chancel were probably both enlarged to the north, the north pier being moved to support the wider span: the south pier which would have been close to the nave wall, was left in situ. In 1499 Thomas Belfin left 13s. 4d. for the construction of a rood loft in Calverton Church, and both piers bear evidence of there having been a rood loft and screen carefully constructed so as not to impede the view of the image of St. Wilfrid, for which he left a further sum of 12d. – perhaps for votive candles. In the 1760s the whole of the nave and tower were extensively altered, under the Rev. Maurice Pugh, so that they were virtually as we see them today. The tower was completely rebuilt using stone from the previous Norman tower. Its windows and west door are round-headed in the style known as '‘Gibbs rusticated'’ on the west and south, but left plain to the east and north where few would see.…….The NAVE was enlarged, probably by moving the south wall, so that the new tower on the site of the old tower was central to the nave. Old stone was extensively re-used, the west end was rebuilt from the foundations and the rest of the nave was at least re-faced externally above the lower courses. 14th century walls were now replaced by round headed ‘Gibbs rusticated’ windows. The then existing medieval chancel remained, this being the responsibility of the Rectors, the Canons of Oxton, Calverton being a peculiar of the Southwell Minster. After the enclosure of 1780 they held land in the north of the parish in lieu of the Great Tithe, and whoever owned that land was from then on responsible for the repair of the chancel of Calverton Church. No great changes appear to have taken place from then until the 1830s, when the new vicar, Samuel Oliver, built a gallery over the West End of the nave (1834). The extra seating thus provided enabled all seating to be removed from the large old chancel: the nave was re-seated throughout with box pews. Thus the Rectors were able to take down the chancel and re-build it as cheaply as possible, as we see it today – the size of the chancel arch alone limited how small they could make it. The beams in the roof are re-used from an earlier structure. Some of the carved stones from the original chancel can be seen built into the chancel north wall outside, giving an idea of the splendour of the previous building. The rectors sold their land in 1856 and from then until 1958 lay rectors were responsible for the chancel: no doubt it was they who bricked in the north and south windows, finding this cheaper than continually re-glazing – vandalism is no novelty……. Samuel Oliver was responsible for Benefactions Board, dated 1833, now in the porch. Built into the south wall of the chancel is a tablet to Mrs Jane Pepper recording her benefactions to the Church and Parish, and giving the strange date for the interment of her body of 17th January 1686/7. This reminds us that until 1752 when England adopted the Gregorian Calendar, our year began on March 25th, not January 1st; thus 1st April 1750 was eleven months earlier than 1st March 1750. (There was also a date lag; to put this right, in 1752 the day after September 2nd was September 14th), but the Gregorian Calendar was adopted by many other continental countries from 1582 onwards: in 1600 Scotland adopted it. In England, therefore, until 1752 events taking place between January 1st and March 25th were sometimes dated in both years – as we find here on Mrs Jane Pepper’s memorial. In 1881 the whole floor of the nave was lowered two feet, ostensibly to restore it to its original level, but this is belied by the height of the bases of the chancel piers. Since at the time the altar was raised on an extra wooden platform, it was probably done to make the altar even higher in relation to the nave. No traces of pillar foundations to suggest arcading were found when the floor was lowered. However, many stones from the earlier building were discovered, some of which are in the clock chamber of the tower: a fragment of 13th century window mullion inspired the replacing of the roundheaded with the present Victorian Gothic in imitation: two fragments of the Norman font influenced the design of the present font (one, the lower part of the basin, is buried below it). The plaster was removed from the interior walls, and not replaced, and while personally removing the layers of old whitewash from the capital of the north pier of the chancel arch, T W Smith discovered the panel of St. Wilfrid already described. A NEW PULPIT was constructed and the old one converted into a chest for frontals, now standing in the south west corner of the nave, by the door. THE GALLERY was removed, the tower arch thrown open to the church and formed into a vestry, and the whole church and chancel were re-seated. All that remains of the box pews of the 1830s is the music cupboard beside the pulpit, which was made by a parishioner for his own domestic use, from parts thrown out by the contractors, and returned to the church by his great granddaughter in 1958. The pew numbers can be seen on the doors. THE MONUMENTS from the walls of the nave were all removed to the west wall. Although no mention is made of the fact on his memorial, Sir John Coape Sherbrooke, a veteran of the Peninsular War, who was for many years resident at Calverton Hall, was also Governor General of Canada, 1816 to 1818, and the city and county of Sherbrooke are named after him. The ‘improved musical notation’ of Mary Cooper was a system in which every semitone had its own line space, thus removing all sharps and flats, but whether this was an improvement is open to question: it did not catch on……. THE ROOF of the nave was entirely renewed in 1881, with the exception of some king posts and struts from the old roof (which in plan was exactly reproduced). THE SOUTH PORCH was built at this time and the south window of the tower was blocked up and made into a cupboard. Previously, the west door under the tower had been the only entry to the church. THE ORGAN CHAMBER was built in 1888 on the south side of the chancel and the present organ installed. THE CHILDREN'S TABLE dates from the 1930s, the reredos, representing the Transfiguration, was painted in 1968: it shows plants and animals of the Bible, and the children mentioned in the New Testament (also the seven ‘I ams’ of St. John). The Sunday School banner with its Saxon motif representing St. Wilfrid was presented in 1959. THE WALLS OF THE NAVE now also carry the War Memorials for the two world wars, and a memorial to Colonel Frank Seely, and Mrs E and Mrs G Seely. His father, Sir Charles Seely, had also been a great benefactor to the parish, which presented him with an illuminated address, now to be found in Calverton Museum. The Arms of the Commune of Longue-Jumelles on the south wall of the nave at the east end were carved by Michel Guesdon and Roger Deniau, residents of Longue, from local stone, the nameplate from local slate, presented to Calverton in May 1979, installed in the Parish Church, and dedicated Ascension Day 1980. Calverton was officially twinned with Longue-Jumelles in the Loire valley, France in May 1974. As has already been described the tower was completely rebuilt from old materials in 1763 – the inscription over the door reads: ‘Mr Pugh, Vicar, Saml. Pugh, Ino. Barrett, Churchwardens, Wm. Barrett, mason.’ It incorporates many stones from the original Norman tower, which was probably rather larger: fret, roundels, dog tooth and other designs are found. The arch over the door to the William Lee Annexe was built in 1962 from stones found under the nave floor in 1881, probably from the Norman west door. Domestic animals are well represented: note especially the cat, and the cow with a man's face on its nose – both themes to be found in the south wall of Southwell Minster. (The small head above was probably a corbel from moulding above a window). THE WILLIAM LEE ANNEXE built in 1962 commemorates the traditional link between Calverton Church and the inventor of the stocking frame. Some have said that William Lee was ‘Vicar of Calverton’, but it would seem that one James Revell was vicar from 1584 to at least 1590 (he died in 1620). However, since William Lee was probably in Holy Orders, it would be very natural for him to assist in his own parish church, so that parishioners, looking back in later years, thought of him as being vicar. On the wall of the annexe is a list of the hosiery manufacturers who contributed towards its building. The border shows the arms of Cambridge University and of the colleges to which Lee belonged, views of stockingers cottages in old Calverton, copies of pictures from old documents relating to the industry and of the illustration of Calverton from the Rampton tapestry of 1632, showing the church as it was in William Lee's time. There is also a copy of ‘The origin of the Stocking Frame’ a painting to be found in Nottingham Castle Art Gallery, not now considered to be historically accurate. When these last two, of London manufacture, were taken to the Victoria and Albert Museum workshops for repair in 1961, Charles Oman, the authority on English Church Plate, suggested that they were copies of the previous Elizabethan chalice and paten, made with the same silver melted down. There are also a Victorian chalice and paten dated 1875 and 1876 respectively, given to Calverton Parish Church, Easter 1900 by J.J.T. Canon of Southwell this being Canon Trebeck, Sub Dean of the Minster. Up the stairs on the west wall of the RINGING CHAMBER, some two foot above the top step of the long flight, is a carving, on its side, of a man digging. To the right of the window in the ringing chamber is a fragment of a medieval coffin lid, and further to the right, on the north wall, three carved stones forming part of a frieze of leaves. There may also be part of a sundial high in the south east corner. One storey high in the CLOCK CHAMBER, are the other loose stones found under the nave in 1881: note especially the fragment of mullion, the section of Norman font, and part of an arch moulding with the head of a beaked monster on it, from a different arch from that rebuilt over the William Lee Annexe door. This room also contains the iron chest, dated 1810 with registers dating back to 1568, including entries relating to the family of William Lee. On the west wall of the clock chamber are the remaining nine of the well known Norman carvings of the occupations of the seasons. They represent a very widespread tradition: the floor of the Cathedral of Otranto in Southern Italy has similar Norman representations on the months of the year: though possibly our stones represent rural occupations through the year, rather than a formal series assigning different tasks to each month: similar scenes are found in twelve month panels on the sides of a Norman font at Burnham Deepdale in Norfolk, and the months suggested for the Calverton stones are in the main from comparison with these. THE CLOCK dated 1812 was originally in Farnsfield Church. It is a 24 hour clock with one dial. When Farnsfield replaced it in 1879 by an eight day, two dial clock, it was sold for £20 to Calverton Church, the bill being defrayed by Samuel Potts of Mansfield, formerly of Calverton, and at the same time the tenor bell on which the hours are struck was bought by subscription. From the clock chamber a door leads out on to the roof: the stonework round this door has moulding on it, no doubt carved for the previous building. The treble is inscribed ‘Jesus be our speed,’ and the second bell ‘God save his Church.’ There was a song written in 1879, when the tenor bell was hung, called ‘The Bells of Calverton’ which has as part of the theme music of the chorus the sound of the three bells, treble, second and tenor, showing that the tenor bell was hung for ringing, not merely to sound the hours. Third bell was added in 1897 as a memorial to the Diamond Jubilee of Queen Victoria, when all the bells were re-hung and renovated as necessary. A double roll arch is rebuilt into the west window of the bell chamber – it may be Norman, but more probably is from a 13th century pointed arch. There is a ladder leading from the bell chamber to a trap door opening onto the roof. The tower is just under 50 foot high. This page originally appeared on the official web site for St Wilfrids Church, Calverton. We have reproduced it purely for archive and educational reasons.